My recipe for Pasca, a traditional Romanian Easter Bread, has a touch of sweetness with fresh lemon zest. You’re in for a treat with a sweet filling of ricotta, lemon, and raisins. 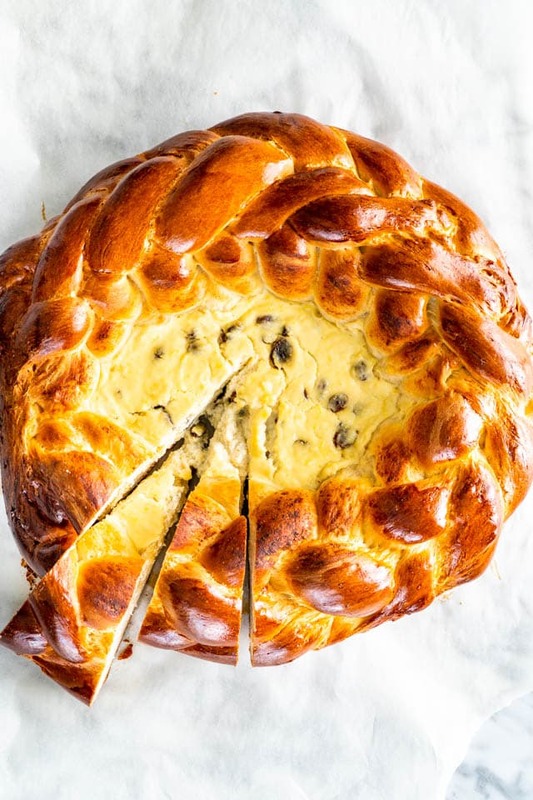 Learn how to make this gorgeous sweet bread with an easy 6-strand braided edge! 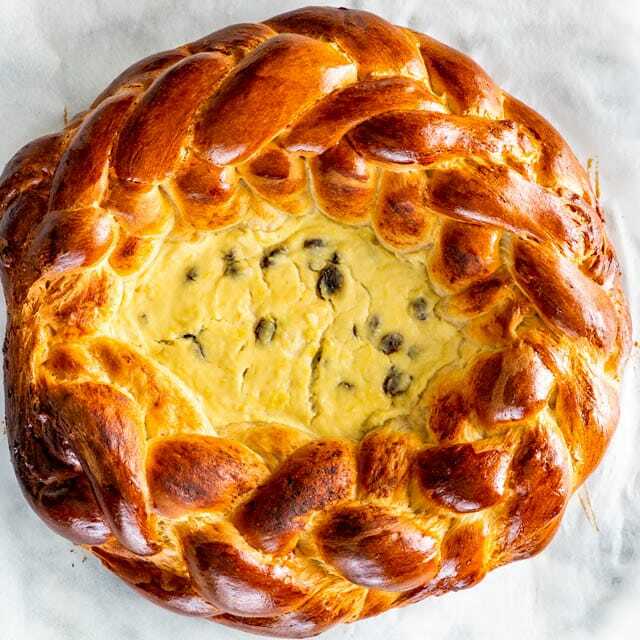 I’ve had so many requests for this amazing Romanian Easter Bread, and here I am with, what I think is, the best version! 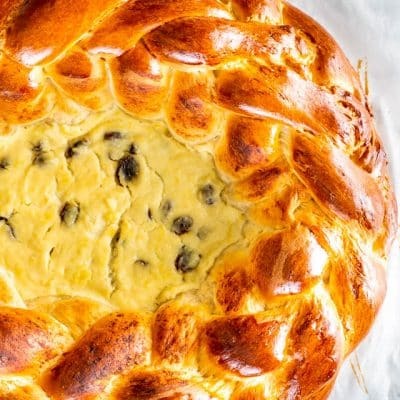 Using a similar dough that my Cozonac recipe is made with, this sweet bread is sure to be a hit at your Easter brunch this year. What makes this pasca recipe so special is that ricotta filling in the center. Seriously, once you try a bite you’re going to want to grab a a spoon and eat all that filling right up! Both the dough and the filling are hit with a healthy amount of fresh lemon zest which just takes this recipe over the top. I’ve also included instructions on how to make the gorgeous 6-strand braid that you see around the edge of the pasca. Are you ready? I sure am! As I said above, this is a sweet bread that everyone has on their tables for Easter in Romania. It’s as popular as hot cross buns are here in North America – it’s serious business. What I really love about this particular sweet bread is that with the ricotta filling, you can slice it up and serve on its own for a light meal. It’s like an Italian panettone meets cheesecake! What Ingredients Do I Need to Make Pasca? I know this pasca recipe looks so ornate and complicated, but it is deceptively simple. Keep scrolling for the full recipe and ingredient amounts. 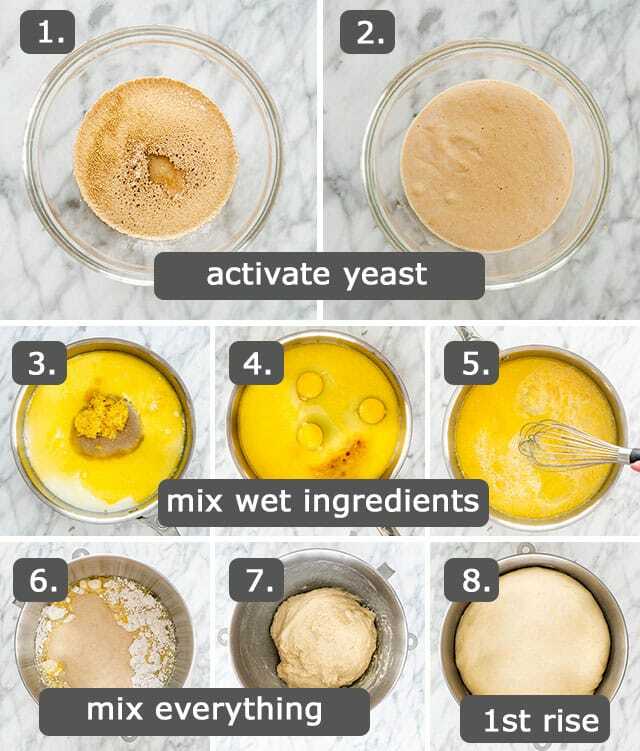 Active dry yeast – You can use instant yeast if that’s what you have. If you use instant, you won’t need to bloom it first, but it’s a good idea to test if it’s still alive. If your yeast doesn’t foam up your yeast is dead and the bread won’t turn out. Water – The water is used to bloom our yeast. Make sure it’s lukewarm – you can test with your finger. It needs to be warm to the touch, not hot. If it’s too hot it will kill the yeast. Milk – I used whole milk (3.25%) but you can use whatever is in your fridge. Butter – I only use unsalted butter. This way I have full control over the sodium in my recipes. Lemon zest – I know 2 tablespoons seems like a lot, but this recipe makes a pretty large pasca. The lemon is what really makes this bread taste so incredible! You can, of course, add less or more depending on your tastes. Sugar – This bread is meant to have a touch of sweetness. You can add a little more or less if you’d like. All-purpose flour – You can use bread flour for this recipe if you’d like. The difference is that you’ll get a bit more gluten formation. If you use gluten-free flour, make sure to get a protein such as xanthan gum to replace the gluten. Eggs – Use large eggs for this recipe. Vanilla – The way the vanilla warms up the lemon zest is just irresistible! Ricotta cheese – You can use a low-fat ricotta if you’d like. Since this is the star of the show for your filling, getting a good quality ricotta will taste so amazing. Sugar – You can adjust the amount of sugar in the filling to suit how sweet you’d like it to be. Eggs – The eggs are used to bind the filling and keep everything together without spilling out when you slice the pasca. Lemon zest – The lemon makes the flavor of this filling really pop! You can add more or less zest if you’d like. Vanilla – Just like in the dough, the vanilla tastes incredible paired with the lemon zest in your filling. Bloom the yeast: Dissolve the yeast in the warm water. You can add a tablespoon of sugar from the sugar needed for the dough to help activate the yeast. Let it sit for 10 minutes until it has foamed up nicely. If your yeast doesn’t get foamy, don’t move forward. Buy a new jar and store it in the freezer so it lasts longer. Dissolve the sugar: In a saucepan, add the milk, butter, lemon zest, sugar, and vanilla. Stir over medium heat just until the sugar dissolves a bit. We don’t want the mixture to boil or get too hot. It should just be warm to the touch. Remove from heat and whisk in the eggs. Finish the dough: Add the flour, yeast mixture, and milk mixture to the bowl of your mixer. Knead it with the dough hook for about 5 minutes until it’s soft and elastic. Remove the dough, spritz the bowl with cooking oil, place the dough back in, cover with a clean kitchen towel, and let the dough rise until doubled in size. Make the filling: Whisk the filling ingredients together, cover with plastic wrap, and store in the fridge until you’re ready to use it. Assemble the pasca: Split the dough into 4 equal-sized pieces. Spritz them with some cooking spray so they don’t dry out. Roll one of the pieces out until it’s about 10″ in diameter. Split the other 3 pieces in half, and roll each piece into a 36″ long rope. Read below for instructions on braiding the ropes. 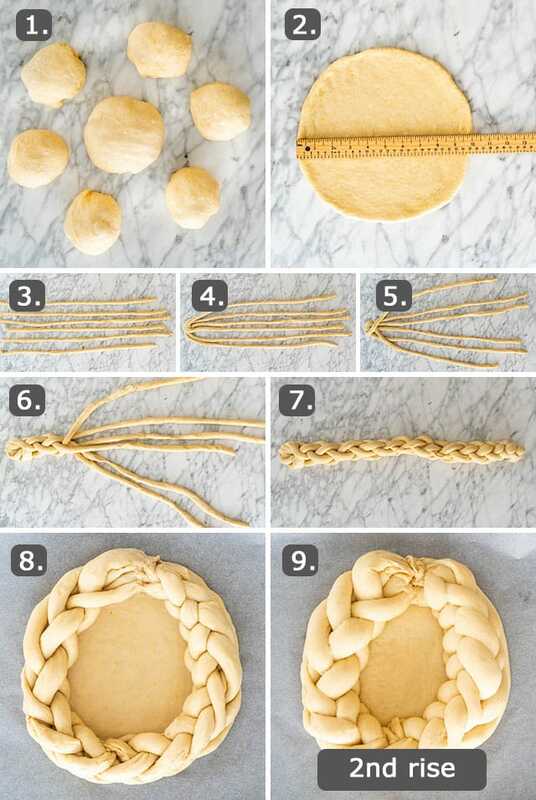 Wrap the braid around the edge of the 10″ rolled circle of dough. Pour the filling into the center, and leave the pasca to rise for 20 minutes. Bake the pasca: While you wait for your bread to rise, preheat the oven to 350F. Brush with egg wash then bake for 40 to 45 minutes, or until nicely browned. The centre will still be a bit jiggly when you take it out. 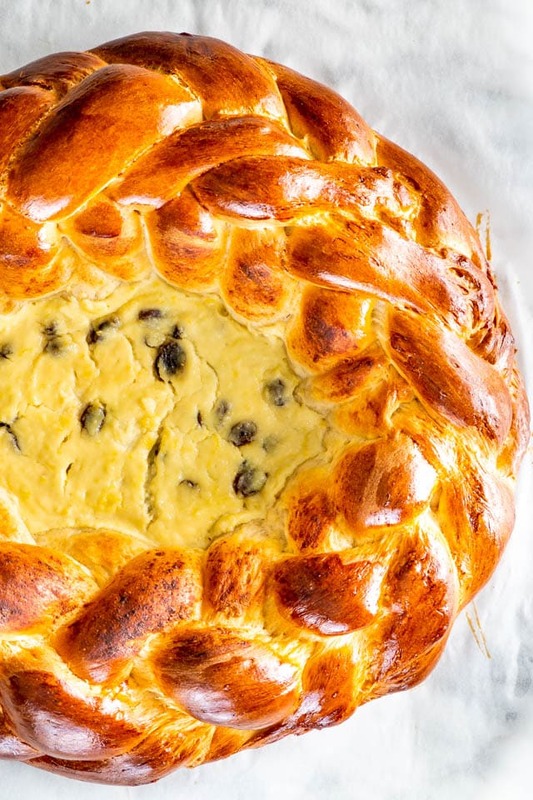 When you have a traditional Romanian Easter Bread, it will always have a gorgeous braided edge. Follow these instructions along with the photos attached. Start by pinching all 6 ropes of dough together at one end. Organize them by placing the two outermost ropes off to the sides with the other 4 ropes in pairs. Cross the two outer strands, keeping them off to the side. Bring the outer left strand to the center, then bring the 2nd strand from the right over to the outer left. Bring the outer right strand to the center, then bring the 2nd strand from the left over to the outer right. Repeat steps 2 and 3 until you have no dough left. Pinch the end of the braid and roll it slightly to seal the ends of the ropes together. If the 6-strand braid in this pasca recipe is too complicated, you can definitely do a regular 3-strand braid instead; just like braiding your hair. It will still look absolutely amazing! Make sure your yeast is still alive. If it doesn’t foam up in the warm water, it is dead and you’ll need to get a new jar. Store it in the freezer to give it a longer life. If your dough feels a little too sticky, add 1 tbsp of flour at a time until it’s perfectly soft and elastic. Let the dough rise in a warm, draft-free environment. Setting your oven to the lowest setting and turning it off is a great way to rise your dough faster. You can make this pasca recipe without a stand mixer. I love to use the dough hook on my mixer to save my arms, but you can absolutely knead this dough by hand. The key here is kneading it for long enough that we form enough gluten to allow this bread to rise nicely and give the bread the perfect balance between soft and chewy. Wrap your leftover pasca well with plastic wrap or store it in an airtight container in the fridge. This will last 5 days refrigerated. Because of the ricotta filling, this bread isn’t ideal for the freezer. There’s a lot of moisture in ricotta, and it will become quite soggy after being frozen and thawed. Did You Love This Romanian Easter Bread? Try Some of My Other Classic Romanian Recipes! My recipe for Pasca, a traditional Romanian Easter Bread, has a touch of sweetness with fresh lemon zest. You're in for a treat with a sweet filling of ricotta, lemon, and raisins. Learn how to make this gorgeous sweet bread with an easy 6-strand braided edge! Activate yeast: In a bowl add the yeast and warm water, stir it a bit and let it sit for 10 to 15 minutes to activate. You can also add 1 tbsp of sugar from the 1/2 cup of sugar needed for the dough, to help activate the yeast. The yeast should bubble up. If you don't see it bubble up, then the yeast is old. Do not proceed because your bread will not rise. Combine wet ingredients: In a sauce pan add the milk, butter, lemon zest and sugar. Heat it over medium-low heat just until the butter melts and the sugar is dissolved. Do not boil it, it just needs to be warm to the touch. If it gets too hot it can kill the yeast. Remove from heat. Whisk in the eggs. 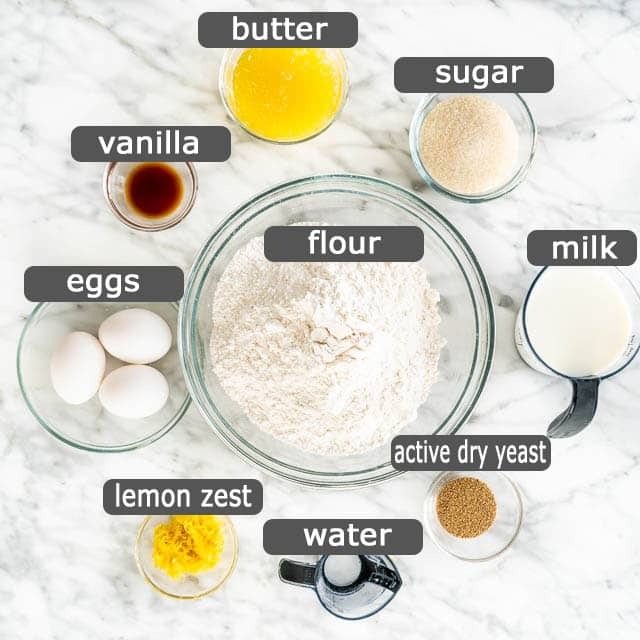 Make the dough: To the bowl of your mixer add the flour, the milk mixture, and the yeast mixture. Using the dough hook mix everything for about 5 minutes until everything is well blended together and the dough should come off the sides of the bowl. The dough will be a softer dough and somewhat sticky to your hands. The more you mix the dough the fluffier it will be. Let the dough rise: Take a large bowl and oil it with about 1 tbsp of the vegetable oil. Place the dough in the bowl and use the other tbsp of vegetable oil to rub over the dough. Cover the bowl with plastic wrap and place in a warm, draft free environment. Let the dough rise until it doubles in size, could take 1 to 2 hours. Alternatively you could let the dough rise in the mixer bowl. Prepare oven and baking sheet: Preheat the oven to 350 F degrees. Line a large baking sheet with parchment paper. Divide dough: Divide the dough into 4 equal pieces. Take one piece and roll it into a 10 inch circle. Place it on the prepared baking sheet. Divide the other 3 pieces in half so that you end up with 6 pieces. Braid the dough and let it rise: Roll each one into thin ropes about 3 feet long. Braid them and place them in the prepared pan in a circle around the edge of the 10 inch circle. Let this rise for a 2nd time until doubled in size. Prepare the cheese filling: Make the cheese filling by mixing all the ingredients together. Pour this into the pasca (see pictures). Bake: Brush the dough with egg wash and bake for about 40 to 45 minutes or until the crust is deep brown but not burnt. Storage: Wrap your leftover pasca well with plastic wrap or store it in an airtight container in the fridge. This will last 5 days refrigerated. Because of the ricotta filling, this bread isn’t ideal for the freezer. There’s a lot of moisture in ricotta, and it will become quite soggy after being frozen and thawed. 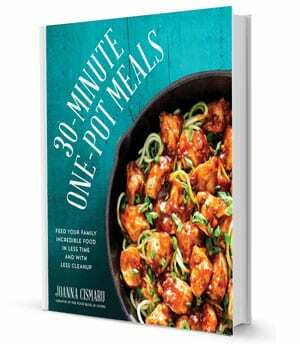 This recipe looks amazing – I can’t wait to try it this weekend. 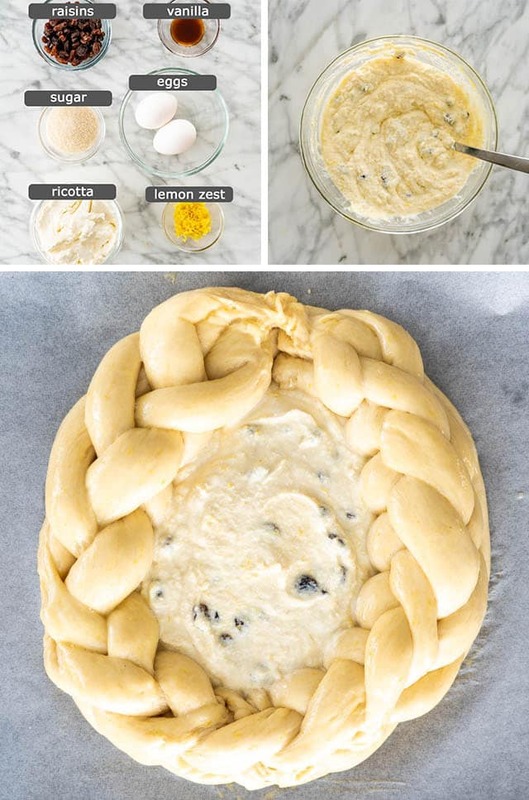 But I have a question – the instructions suggest that you should ‘arrange the braided dough in a circle around the edges of the springform pan’ – what springform pan is this? The rest of the post describes making this using just a baking sheet – did I miss something? 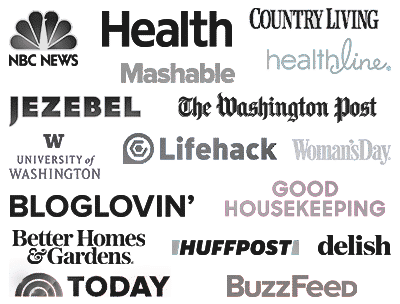 Thanks – and thanks again for sharing all your wonderful recipes. I’ve been loving them! Thanks for catching that! We were originally going to use a springform pan but decided against it; the instructions are all fixed now!